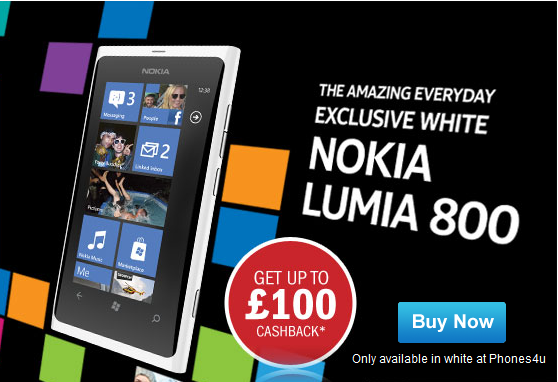 The exclusive to Phones4U white Nokia Lumia 800 Windows Phone is now available for purchase in the UK! The long awaited white beauty with 1.4 GHz processor, 8MP camera and 3.7″ AMOLED screen to name a few features, is available free with contract. The buy now page also mentions you can receive up to £100 cash back. To place your order simply visit the white Lumia 800 splash page, click the buy now button, select your plan, and complete checkout. Phones4U supports plans through O2, Vodafone and Orange. Remember, the white Nokia Lumia 800 is exclusive to Phones4U (in the UK at least), and if you aren’t interested in the white version, you can still purchase it in black, cyan, or magenta.